ORDER YOUR OWN HARD COPY on Amazon.com! 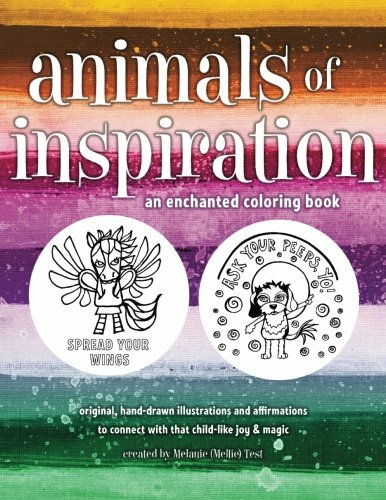 A magical and enchanted coloring book. Includes 42 original hand drawn character illustrations with empowering phrases. Printed on only one side of each page. Bonus section with 6 original hand drawn mermaid illustrations with empowering phrases. Each hand-drawn illustration has been infused with channeled energy to lift your vibration and entrain you to a new energetic frequency as you color! Perfect for ANY inner child! A wonderful way to introduce children to inspiration and spiritual concepts and spark powerful discussion. Visit the RedBubble shop for the Animals of Inspiration and the Magical Mermaids series! Click the image to find magically enchanted prints and products (mugs, tees, pillows, duvets, and more)!